On chicago.gopride.com Michael Roberts posted the transcript from the radio interview that Randy released to Michael yesterday during the Showbiz Nation Live. 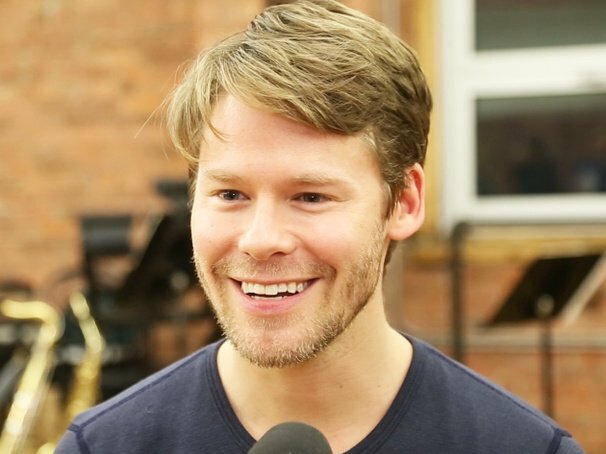 In this interview Randy talks mostly about Cabaret, his role in the musical and the emotional charge that comes with playing such a powerful character. 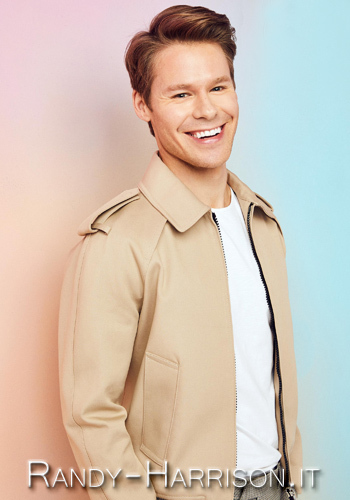 He talks briefly about Queer as Folk and his different roles on stage, such as in Waiting for Godot, Pop!, Wicked, etc. and his dreams and projects for the future. Click on the image below to read the transcript. broadwayworld.com has just published an article about Roundabout's Cabaret with a lot of new amazing photos from the performance, taken by Joan Marcus. Click on the image below to access the article and the photo gallery. The website showbiznoflo.com uploaded a radio interview with Randy. Michael Roberts, host of Showbiz Nation Live, asks Randy about Cabaret, his role as the Emcee and the double audition to get the part, the peculiar relationship which he develops with the audience and the relationship with the cast and the director. Randy talks about his career both in theatre, mentioning the many roles he played, and on television, also mentioning Queer as Folk.
. @Cabaret_Musical is currently on stage at the Benedum Center for the Performing Arts in Pittsburgh with peformances scheduled from the 2nd to the 7th of February and we have some enthusiastic reviews. Click on the links to read the reviews. A few minutes ago broadway.com posted on their Twitter a link to a video from the Cabaret National Tour Media Day. In the clip there are some sneak peeks of the performance and some interviews to Randy, Andrea Goss and some other cast members, Joe Masteroff (the book writer) and BT McNicholl (the director). Our precious Olivia Spuhler posted on her Twitter a short video with a real treat for Randy's fans: the curtain call from Sunday, January 31st, matinee! In this video you can see Randy bowing to the audience and inviting the cast to join him. Thank you again and again, Olivia! ... and three more photos, from the last performance of Cabaret on January 31st in Providence: the whole cast on stage for the final bow! Thank you again to Olivia Spuhler who shared them with us! We have another short video from the last performance of Cabaret in Providence. 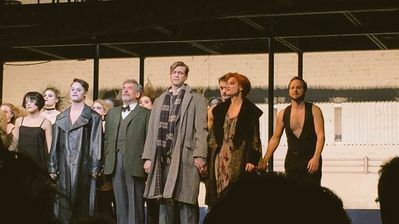 The whole cast is on stage for the final bow. Thanks again to Olivia Spuhler for sharing it with us! 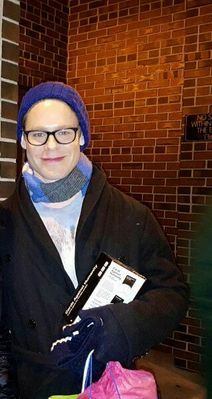 We have two more photos of Randy after the show on January 31st. Thank you so much to our dear Trish for letting us share them on our website with all of Randy's fans! Waiting for Cabaret to arrive at the Benedum Center for the Performing Arts, the Pittsburgh Post-Gazette published an article about Cabaret and the Emcee's pivotal role in the musical. Sharon Eberson, the journalist, interviewed Randy about his career and his "dream role" as the Emcee, described by Randy as mischievous, very intelligent, sort of a Puck! Thanks to Arta James for the heads-up!